Just over two years ago, on February 5, 2016, Governor Rick Scott announced the appointment of the Honorable Harvey L. Jay, III, to the First District Court of Appeal. He joined Judge Bilbrey as the only other First DCA judge promoted from the trial court bench. 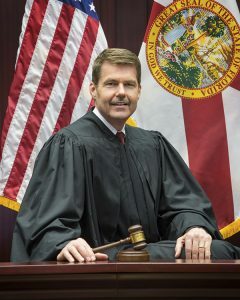 Judge Jay was born and raised in Jacksonville, Florida. His father, Harvey Jay, Jr., is a real estate agent for Coldwell Banker Vanguard Realty, and his mother, Barbara, was a longtime substitute teacher in Mandarin before working in the retail industry for Stein Mart. Judge Jay’s grandfather, Harvey Jay, Sr., a Georgia lawyer, inspired him to pursue a legal career. The senior Jay was a trial lawyer, who worked as a prosecutor traveling the circuit. Jay describes him as a man of high character and integrity and a hard worker, whom he wanted to emulate. Judge Jay attended the Bolles School, where he was active in student government and played varsity football and baseball. He obtained his B.B.A. from Stetson University in 1984 and his J.D. from the University of Florida College of Law in 1987. Following his admission to the Florida Bar in 1988, Judge Jay worked as an associate first for Howell, Liles & Milton, P.A., a large Jacksonville insurance defense firm where he had clerked during law school, and then for the Law Office of Joseph P. Milton, for which he did railroad defense work and plaintiff and defendant Jones Act work. In 1991, he joined the firm that would eventually become Saalfield, Shad, Jay, Stokes, Inclan & Stoudemire, P.A. While there, much of his practice focused on medical malpractice, which included hospital defense, hospital administrative work, and physician defense in state and federal courts. Judge Jay also handled many appeals, which he enjoyed. He remained at Saalfield, Shad until 2012, when he began his judicial career. Judge Jay officially joined the Fourth Circuit in July 2012, where he started out in the civil division. He was later assigned to the family court from January 2013 through December 2014, and returned to the civil division in 2015. While on the circuit court, Judge Jay received the 2015 Jurist of the Year Award from the Jacksonville Chapter of the American Board of Trial Advocates. Now entering his second year of his “dream job,” Judge Jay has had time to reflect on the things he most enjoys about being an appellate judge at the First DCA. He loves research and writing and enjoys thinking through some significant issues with his staff, Diane Scott and Greg Martinson. He readily admits there’s a learning curve at the appellate court, but Judge Jay finds it exciting and rewarding to be continually challenged and thinks the variety of issues raised in the appellate court is stimulating. As a former trial lawyer and judge, the lack of everyday interaction with litigants and lawyers is what Judge Jay likes least about his new job, but he noted he can sit by designation as a circuit court judge, which he has already done once. He plans to do that again, this time in Leon County, so he can gain a better insight into the work done in Leon County courts and the juror population. Judge Jay thinks it is important for appellate judges to be mindful of the differences between trial and appellate court work and to appreciate how difficult it is to try a case. A judicial profile would not be complete without some advice for practitioners. Judge Jay stresses preparation. If a rule or statute is involved, read the entire rule or statute in context. If you cite a case, read the whole case. While electronic legal research makes it easy to focus on isolated portions of statutes and cases, Jay stresses that demonstrating a thorough understanding of the law cited is essential to the practitioner’s credibility. Develop well every issue on appeal, because you never know what may gain some traction with one of the judges on the panel. Judge Jay values accurate representations of case holdings. Parentheticals that include direct quotes for the stated proposition are helpful and trust-building. He suggests minimizing the number of citations for propositions that judges know already, such as the standard of review and well-established principles of law. As for motions for rehearing, Judge Jay is committed to getting it right and he wants to hear if he’s done something wrong. That’s not an invitation for filing rehearing in all cases, but as a former trial attorney, he understands that each case is incredibly important to the litigants and they need to believe their case has been fully considered. Moreover, Jay is committed to judicial credibility, which is best accomplished by consistently following the law. Judge Jay is married and has two daughters. Wendy Loquasto is the managing partner of Fox & Loquasto, P.A., in Tallahassee. 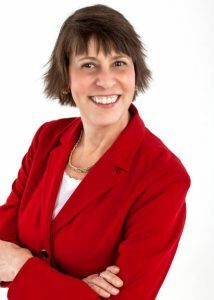 She has a general appellate practice and provides trial support. She’s a former Chair of the Appellate Court Rules Committee and currently serves as Vice Chair of the Workers’ Compensation Rules Advisory Committee. She graduated from Stetson University College of Law in 1988.